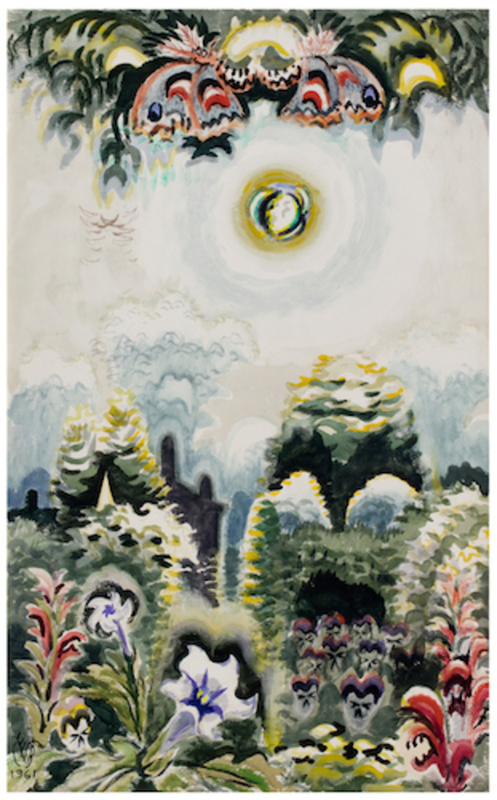 Charles Burchfield, Moonlight in a Flower Garden, 1961, watercolor and charcoal on joined paper, 48 x 30". Start anywhere, go everywhere—that would seem to be the calling card of mid-twentieth-century painter Charles Burchfield’s body of work, which predominately captures scenes from nature and rural, country life as charged by drama, tension, and a freewheeling style that rockets straight out of humble en plein air painting’s crypt and into the stratosphere of vision. The effervescent landscape drawings in this exhibition are often cut through with shafts of light, as in Dawn in Early Spring, 1946–66, which depicts a forest. The picture—done in watercolor and charcoal, as many works in the show are—is centered by a ringed wood backlit by some burgeoning glow while vegetation and trunks teeter between representation and exuberant mark making. In the nearby Moonlight in a Flower Garden, 1961, the sky is a canopy of biomorphic waves balanced above the similarly shaped flora below it: as above so below. Even a series of three lightly sketched ink-and-charcoal drawings are positively calligraphic, with two of them including a line of cursive punctuating the compositions. One, circa 1960, reads “The spirit of winter lurking in a woods” underneath a handful of graceful outlines describing trees. But then, any line throughout the works here could rally itself to a poem, if one were so willing to read it. Light showers down, and clouds and foliage vibrate in their rows of lines and washes, as if threatening to explode into painterly abstraction like the work of Burchfield’s contemporaries over in America’s metropolitan centers during his era. Instead they hold their breath and tenuous forms, basking in an illumination by turns divine and pagan.